ADUs, commonly known as granny flats, backyard cottages, inlaw suites, and accessory apartments, are a form of residential infill housing on the precipice of a massive revitalization in the US. Unique to this form of grassroots housing, both permitted ADUs and informal ADUs are typically developed by amateur homeowner developers rather than professional developers. This presents special challenges and opportunities. Through interviews, images, first-hand anecdotes, literature, case studies, and data analysis, Backdoor Revolution covers these challenges and opportunities in detail. This ADU book covers costs, financing, design, the development process, zoning barriers, and regulatory loopholes. It will help explain the expenses involved, financing strategies, and the legality of alternative dwellings on residential properties in general. 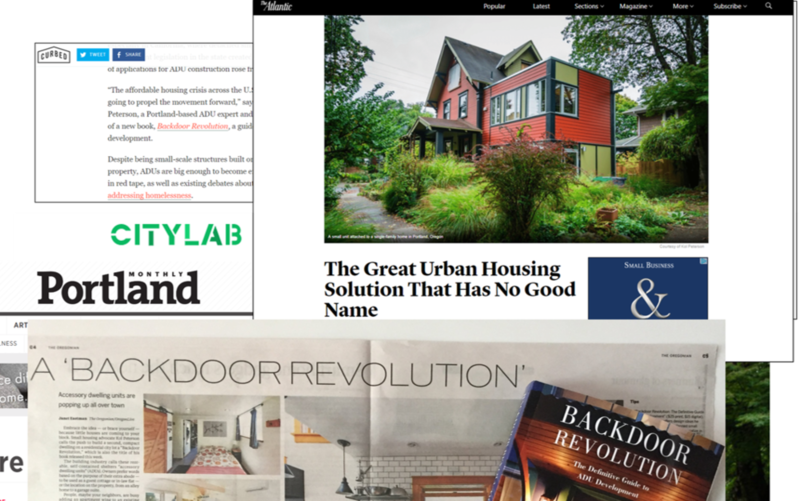 Backdoor Revolution provides a framework for understanding the large-scale, informal ADU housing phenomena that exists in cities throughout the United States. The presence of informal ADUs can be viewed as an ad-hoc housing response to restrictive municipal regulations for ADUs found in the vast majority of US cities and towns; regulations which have historically hindered homeowners from developing formally permitted ADUs. The book offers insightful analysis of the municipal and institutional barriers for permitted ADU development in American cities, and a succinct regulatory prescription for addressing these key barriers. 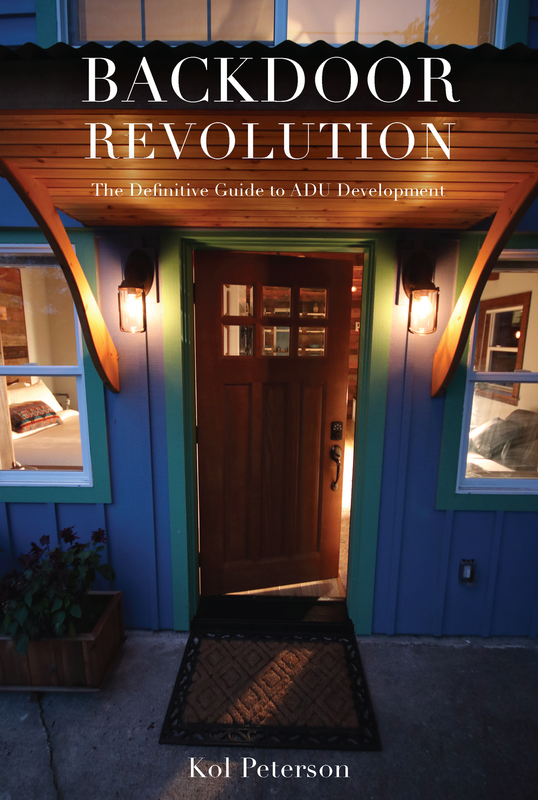 Backdoor Revolution is an A–Z manual on how to create ADUs, written by one of the most passionate, knowledgeable and experienced people in this burgeoning movement. For anyone wanting to build or live in an ADU, or to include as a permitted use in a zoning code, this is the go-to book. The author, Kol Peterson is an ADU expert based in Portland, Oregon, who has helped catalyze the exponential growth of ADUs in Portland over the last decade through ADU advocacy, education, consulting, policy work, and entrepreneurship. He is the owner of Caravan- The Tiny House Hotel, the first tiny house hotel in the world, and organizer of Portland’s popular ADU Tour. As an ADU developer, dweller and consultant in Portland with a background in both government and entreprenership, and a masters degree in environmental planning from Harvard’s Graduate School of Design, Kol offers a unique and personal perspective on what a homeowner can do build wealth and lifestyle flexibility by building an ADU, and how doing this can incidentally address systemic policy challenges locally and globally.